Quetta – A journalist is incomplete without accuracy and impartiality, said Shahzada Zulfiqar President of Quetta Press Club (QPC) on Monday. QPC President made this statement while addressing the concluding session of a workshop held by Center for Peace and Development Initiatives (CPDI). 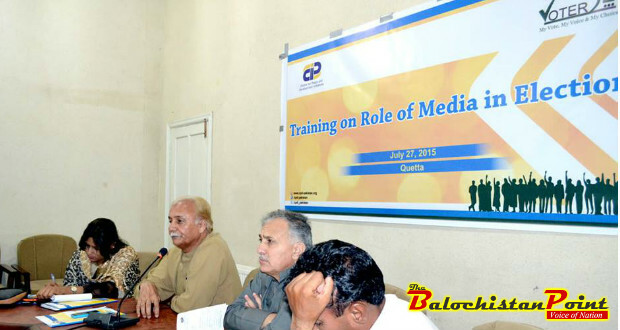 Shahzada Zulfiqar thanked CPDI for training journalists of Balochistan and urged them to conduct similar training programs in interior Balochistan. 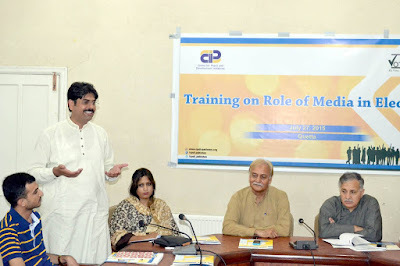 CPDI trainer Mr. Fayyaz delivered lectures on how journalists can improve their election reporting. Mr. Fayyaz urged journalists to acquaint themselves with elections laws, relevant code of conduct before embarking on any election reporting assignment. Group training exercises were conducted to systematically train the participants on how they can best perform their duties during elections. Over two dozen journalists participated in the workshop from different newspapers and television channels based in Quetta. In the end, participating journalists were awarded certificates by President QPC Shahzada Zulfiqar and Saleem Shahid.